You just brushed your teeth – are your gums bleeding? Improper or sporadic brushing can lead to bacteria growth in your mouth, which typically results in red, sore, and bleeding gums when you do brush. This condition is known as gingivitis. And while the initial stages of gingivitis may not be too painful, gingivitis can lead to more serious forms of the disease. 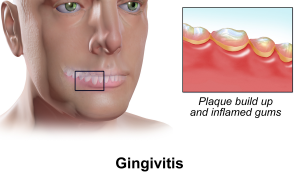 Gingivitis leads to periodontitis, which is a condition that can lead to tooth loss. Daily brushing and flossing, coupled with regular visits to your dentist, is your best defense against the early stages of gum disease. Failure to brush and floss regularly leads to the growth of oral bacteria. This bacteria eventually forms a sticky substance known as plaque. And if the plaque isn’t brushed off or flossed away quickly, eventually it will harden into a substance known as tartar. Left untreated, plaque and tartar eventually lead to tooth decay. Even if your gums bleed when brushing, you should still continue to brush and floss. It is important to remove plaque. Plaque can turn into tartar, which can eventually lead to periodontitis. According to the National Institute of Dental and Craniofacial Research, periodontal (gum) disease is the leading cause of tooth loss among adults. If you haven’t been to a dentist in a while, call the office of David Buran today. With an emphasis on lifetime preventive dental care, Dr. Buran offers a full range of dental services to meet your individual needs and preferences. Follow these dental care tips, even if your gums bleed when brushing, and schedule a check-up with Dr. Buran today.